Spent the morning finishing off the blogs. They’re all up and there should be no spaces now. Drove in to Glasgow at lunch time and did a short spell of waltz and the start of Ballroom Tango. Not quite as demented as Argentinian Tango with all its flicks, kicks and ganchos, or maybe that’s still to come. For now it was a repetitive “Slow, Slow, Quick, Quick … pause” and repeat. One set going forward and one set going to the side. You have to see it to understand. After that it was Jive and Spin 5 to add to the four we already (sort of) know. Actually, Spin 5 wasn’t too bad. Spin 4 is the worst at present. Went for a cup of tea for me and a milk shake for Scamp afterwards to slake our thirst. Watched a stretch limo pull up on a busy Queen Street to allow a bride, groom and all the hangers on to exit and have photos taken walking up the street. I though it funny to see the bridesmaids deciding it might be a good idea to lift the bride’s train. Otherwise she would have managed to clean up all the fag buts on the street. Note to american readers, that’s not what you think it is! It does however create an interesting picture in your heads, I’m sure. 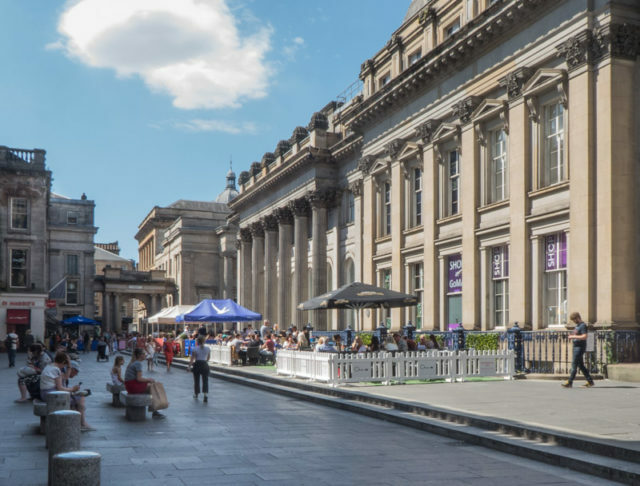 Wandered past the GOMA to grab a shot of Glasgow in the sun. That became PoD. Went for a snooze when we got back. Think I might be coming down with Scamp’s cold. Just feeling a bit ‘wabbit’ tonight. Washed out. It’s all this sun that’s doing it. It’s so unusual for Scotland to have this amount of hot sun day after day. It did cloud over in the early evening today, but later it cleared away again. Due for a cool(ish) 20ºc tomorrow before it rises again for the weekend. Tomorrow? Scamp’s meeting Isobel and June for coffee and as my coffee buddies are looking after grandchildren, I might stay at home and practise Easa’s painting method on a bunch of sweet peas.